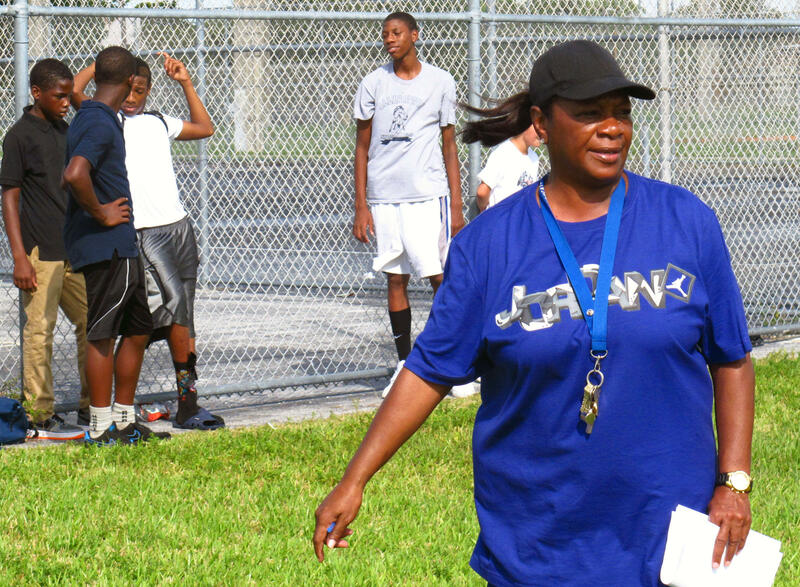 Veldreana Oliver has taught physical education for 28 years at Allapattah Middle School. More recently, her principal asked her to teach writing, speech and debate. Last week StateImpact Florida told you how a middle school in Miami has added speech and debate courses this year to improve reading, writing and speaking. The school’s principal, Bridget McKinney majored in debate and thought the requirements for Florida’s new Common Core-based standards sounded a lot like her college classes. She needed a writing teacher for new speech and debate courses she wanted to create. But like many Florida schools, Allapattah Middle has plenty of expectations but a limited budget. She couldn’t hire a new teacher. It wasn’t in the budget. So she turned to what seems like an unusual place -- physical education teacher Veldreana Oliver, who has been with the school for 28 years. “Let’s go! Dale!" Oliver hollers at students looping around Allapattah's campus. "Dale! Dale! Dale!" A Miami middle school added speech and debate courses for every sixth, seventh and eighth grader. But it wasn't easy. She's getting her students ready for a timed one-mile run. But now she’s also getting them ready for the state’s new, annual exam. When Principal McKinney proposed the idea this summer, Oliver says she wasn’t sure she was the right fit. The next day, Oliver showed up at school with reams of research and lessons about teaching reading and writing. McKinney says that’s why she picked Oliver. Last year Miami-Dade school leaders asked McKinney to add a creative writing course. There was no money to hire someone new. So McKinney asked Oliver to teach the class. Stacks of books in Veldreana Oliver's classroom. Oliver’s students earned some of the best FCAT scores in the school – particularly her students who were learning English. Coaching up the gym teacher isn’t the only way Principal McKinney has gotten creative. She lured LaDemia Albury away from a top-rated school to teach speech and debate at Allapattah. That transition includes some compromise to make the debate classes fit. Allapattah has a growing Hispanic population, particularly new immigrants from Honduras. The school can’t hire enough translators, so Oliver and other teachers ask bilingual students to translate for students who don’t speak much English. And the school had to make one big sacrifice to add the speech and debate courses – Allapattah no longer has a band class. There are still more than 140 kids in the band, but now, they meet and practice after classes. Oliver says she doesn’t feel like she’s had to give anything up. After 28 years at Allapattah, she loves the freedom to design the creative lessons her new role requires. But she still considers herself a PE teacher. For the past year the Hechinger Report and StateImpact Florida have taken you into two schools to hear what preparations for Florida’s new Common Core-based standards sound like. The standards outline what students should know in math and language arts. When classes start this fall every grade in every Florida public school will use them. But are schools ready? Now, we share with you what we've learned along with the Hechinger Report's Jackie Mader. Public support for Common Core math and language arts standards dropped in the past year, and less than half of teachers now say they support the standards, according to an annual back-to-school poll Education Next. Holiday rerun: This story was originally published Oct. 3, 2014. Bridget McKinney, principal at Miami's Allapattah Middle School, says her students struggle to pass the state's reading and writing tests. So when McKinney first read the Common Core math and language arts standards used in Florida schools this year, what jumped out was the emphasis on answering questions and making arguments using examples and evidence from what students are reading. Miami-Dade Superintendent Alberto Carvalho said Florida leaders should rethink the scope and purpose of education testing, and give schools more time to prepare for new math and language arts standards. Carvalho's proposal was published online and emailed to reporters. Carvalho has also been tweeting excerpts since Monday.